The Casa Herrera tamale extruder is a fast and efficient machine that consists of two independent hoppers, one for masa and one for filling, both conveying augers are driven by separate motors with variable speed controls by inverter/potentiometer. It includes a tamale conveyor with table-like sides that allow your personnel to take a piece and wrap it in paper or corn leaf. Stainless steel construction on auger flights, food hoppers, nozzle, and any food contact surface. Stainless steel covers and panels. Augers in masa and meat hoppers are 6" diameter with Posi-Pressure flight configuration. Unit is directly chain driven with independent variable speed drives. Each auger is equipped with RPM tachometer readout. Legs are adjustable equipped with neoprene casters (locking type). Nozzle height to be 33" to 36" adjustable. Each hopper compartment is equipped with low level sensors to shut down operation if either become starved for product. Hoppers are equipped with funnel type opening for filling purposes. 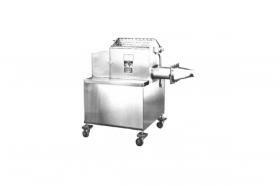 The tamale extruder is capable of producing 180-200 dozen per hour of tamales weighting 5-5 1/2 oz. 4" long,2 1/2" circumference and comprised of 50% masa 50% filler.